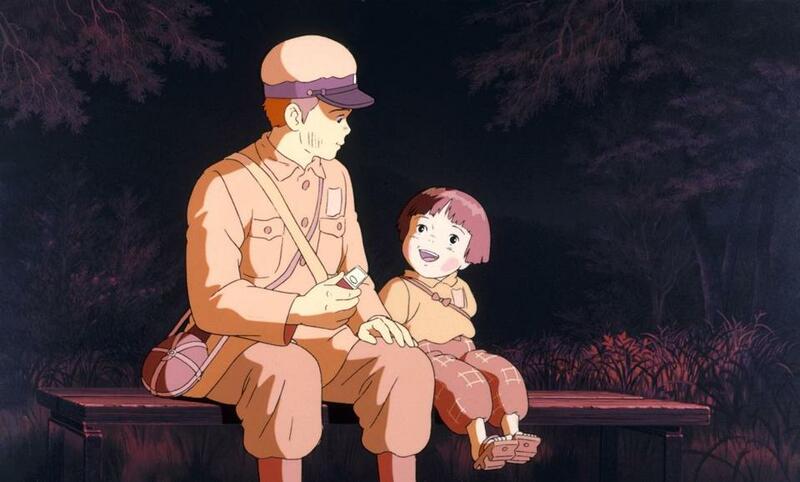 A calm moment in “Grave of the Fireflies,” Mr. Takahata’s wrenching World War II drama. NEW YORK — Isao Takahata, a film director who founded Japan’s premier animation studio, Studio Ghibli, with Hayao Miyazaki in 1985 and made sophisticated animated films like the elegiac World War II drama “Grave of the Fireflies,” died early Thursday in Tokyo. He was 82. The cause was lung cancer, Studio Ghibli said in a statement. Studio Ghibli has released some of the highest-grossing animé films ever, like “Ponyo,” “Howl’s Moving Castle,” “Princess Mononoke”, and “Spirited Away,” which won an Academy Award for best animated feature in 2003 after an English version was released. These lushly animated fairy tales were all written and directed by Miyazaki, whose name is more recognizable to international animation aficionados than that of Mr. Takahata. “If Studio Ghibli is your favorite band, then Mr. Takahata has the deep cuts from the back catalog,” Dave Jesteadt, now the president of GKIDS, which distributes many Ghibli films in the United States, told the Los Angeles Times in 2014. The disparity in their recognition might in part have had to do with Mr. Takahata’s output, which was considerably smaller than Miyazaki’s. Mr. Takahata took longer to complete films than Miyazaki, who is known for his unflagging work ethic. Mr. Takahata’s slow pace sometimes caused resentment — Miyazaki jokingly compared Mr. Takahata to “a real slugabed sloth” in 1990 — but it also led to meticulously crafted films. Many of Mr. Takahata’s movies were popular, particularly in Japan, and many critics praised his work, especially “Grave of the Fireflies” (1988), a harrowing tale of a brother and sister trying to survive after Japan is devastated by American firebombing during World War II. The film, written and directed by Mr. Takahata and adapted from a story by Akiyuki Nosaka, dealt frankly with cruelty and death but also had moments of innocence, beauty and grace. “This film proves, if it needed proving, that animation produces emotional effects not by reproducing reality, but by heightening and simplifying it, so that many sequences are about ideas, not experiences,” Ebert wrote. Mr. Takahata’s other films include “Only Yesterday” (1991), a contemplative tale of a woman who reminisces about her past on a trip to the countryside, and “Pom Poko” (1994), an environmentalist fantasy about shapeshifting raccoonlike animals called Tanuki that struggle to maintain their lifestyle against encroaching suburbs. Both films were drawn in naturalistic styles, even when they depicted fantastical subjects, a hallmark of a lot of animé and many of Studio Ghibli’s films. Mr. Takahata, who was not an animator himself, chose a different approach in later films like “My Neighbors the Yamadas” (1999), a surrealistic family story drawn like a comic strip; and his last film, “The Tale of the Princess Kaguya” (2013), a dreamy, watercolored portrayal of a Japanese folk tale. “The Tale of the Princess Kaguya” took Mr. Takahata about a decade to finish, though he worked on other films at the same time. It was nominated for an Academy Award for best animated feature in 2015. “The film’s tone — the sense of characters grasping to hold on to innocence as the civilized world whisks it away — is all Takahata,” the critic Ty Burr wrote in The Boston Globe in 2014. Mr. Takahata was reported to have been born on Oct. 29, 1935, in Mie prefecture, in southern Japan. He grew up further west in the city of Okayama. He graduated from the University of Tokyo, then started his career in animation in the late 1950s at Toei studio, where he met Miyazaki. Mr. Takahata worked on television animé series like “Lupin the 3rd” and “Heidi: A Girl of the Alps,” and also directed the film “Gauche the Cellist” (1982), before the two men created Studio Ghibli.